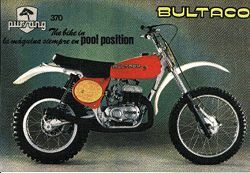 A Spanish roadracing champion both before and after the war, Francisco Xavier Bulto co-founded the Montesa company in 1946. He resigned his directorship after a board meeting voted to retire the factory from GP road racing in 1958. 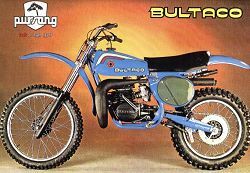 That same year, with other former members of the Montesa firm, he began tooling up for a new motorcycle which was announced early the following year as the Bultaco, a name suggested by John Grace. The first model was the Trailer 101, a 51.5x60mm 125 cc two-stroke putting out 12bhp and capable of 71mph - very healthy performance indeed for the day. It had good brakes, modern suspension, a four-speed box and a host of goodies which appealed to sporting riders. They sold 1136 of these in their first year of production, the sales being given a considerable boost by their first GP win - a race in which they competed against the DOHC MV and the Desmo Ducati. The following few years saw more racing successes, a greater range of models including the TSS racers, and considerably improved sales. In 1965 they released the first Sherpa T trials model, designed with the aid of Sammy Miller whose expertise had been lost by the Ariel factory after they rejected his submission for a new model. The Sherpa T became the definitive tool for the serious trials rider, as demonstrated by Miller that year when he won the Scottish - the first ever win by a foreign marque, and the first by a two-stoke. 1965 also saw the introduction of the Pursang series which soon made its mark on the US market, and sales began to soar. The Metralla Mk2, released in 1967, was an enormous success - it was fast and reliable, had good brakes and suspension, and in most countries was very inexpensive. It had an enclosed drivechain which enabled owners to gain extraordinary mileage - one owner reported 33,000 miles on the original chain. As with most Bultacos it was fitted with rebuildable Betor suspension units. Sources: Cycle World, January 1970, pp. 58-62it.